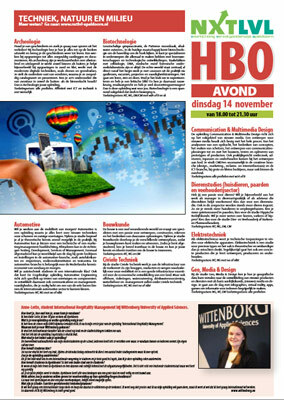 From 13 - 15 November the NXTLVL Education Fair takes place in Apeldoorn. Wittenborg student Anne-Lotte Keijzer was interviewed for the NXTLVL newspaper about her experience as a Dutch student at an international institute of higher education. Wittenborg is one of the institutions that will showcase their degree programmes to prospective Dutch students on the second day of the fair, 14 November, in the ROC Aventus building where the university is located. I am 18 years old and from Apeldoorn. What are you studying at Wittenborg? I am a first-year student at Wittenborg doing an IBA (Bachelor) in International Hospitality Management. 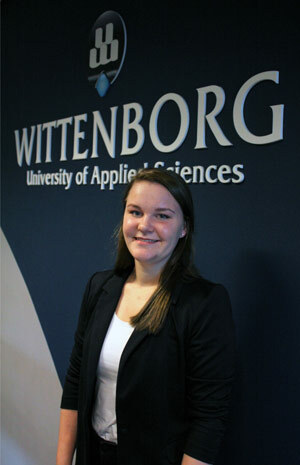 Why did you choose to study at Wittenborg? I like the international character of the university and am happy with my chosen programme. The fact that the entire programme is taught in English is also a plus for me. The number of nationalities found at Wittenborg means everyone has something interesting to tell about where they come from and bring a touch of their own cultures to the classroom. What has your experience of Wittenborg been so far? Up to now I have liked it a lot. On Introduction Day I already met a few nice fellow students to hang out with. Would you recommend studying at Wittenborg? If you like an international student environment and have good English language skills, I would definitely recommend this institution. What do you think of Apeldoorn as a growing student city? I have lived in Apeldoorn my whole life and quite familiar with all its hotspots. It is not as lively as a big city, but very nice if you know the right places. It has all the facilities of a bigger city, but at the same time feels safe and familiar. What advice would you give prospective students in preparing for their studies? Go to as many open days as possible and consider all your options. What are your study goals and career plans? I would love to do an international internship and thereafter decide about my future. I am still unsure of which direction I want to go with my career but know I want to work internationally. That is why I think Wittenborg was a good choice.